Seaweeds~ a.k.a. Sea Vegetables~ of all kinds are High in B12, IODINE, MAGNESIUM, CALCIUM, IRON and much more!! When you think of iodine and magnesium, think MELANIN. Not to worry, we’ll talk more about melanin at another time. 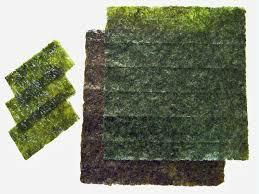 There’s MOSS (erroneously called irish moss); NORI(used for sushi); DULSE; HIJIKI; ARAME; WAKAME; and, countless others. The other day I made these great Organic Nori Wraps filled with Spinach leaves, fresh Garlic, sweet Red Onion, Red Bell Pepper and a special Vegetable Protein, topped with Goddess Dressing. They were Absolutely Divine~ living, vibrant and filled with electrolytes. YROID (And, ALL GLANDular), REPRODUCTIVE and RESPIRATORY health~ not to mention, HAIR and SKIN health!